Adoption of the Open Web Platform —a full-fledged programming environment for rich, interactive, cross-platform applications, with HTML5 at its core— is in full swing. One year ago Gartner research predicted that "by 2014, HTML5 will be the mainstream enterprise app vehicle." More recently, the authors of Vision Mobile's "Developer Mindshare Q2 2013" published survey findings showing that "HTML5 grows in popularity as large groups of web developers are leaping over the ever-shrinking chasm from desktop to mobile apps. Moreover, HTML5 allows for the development and deployment of apps that work across different platforms, usually at a lower cost of developing HTML apps, and for most app categories." Web for All. The Web plays a vital role for many people around the world to share, work, and create. To ensure the Web is available to all, W3C continues its pursuit of standards capable of addressing diverse requirements for security, privacy, accessibility, and world languages. Industry Transformation. Mobility, social networking, and ubiquitous network access are transforming all industries. Enterprises and consumers are looking for integrated experiences across devices. The Web offers the most economical way to reach people on the broadest range of devices. In the past six months W3C has made significant progress in outreach to the digital publishing, automotive, and television and entertainment industries. Inclusion and Participation. To encourage participation in W3C by a broader set of stakeholders, W3C has pursued a number of developer-oriented initiatives in the past 2 years, including Community Groups, where innovators can easily bring new work; webplatform.org for developer documentation; W3Conf, W3C's developer conference; and online training. In addition, W3C collaborates with partners in the broader Internet ecosystem, both to represent the values that have enabled the Internet and Web to flourish, and to achieve interoperability at the boundaries of Web technology. We will look at all of these areas in this report, with highlights from the past six months and some upcoming priorities. This is a fraction of all the work underway in W3C groups. The "HTML5 v Native" story continues to attract significant attention, and justifiably so. The market for tablets is expected to grow fivefold by 2017, and global revenue from app stores is expected to rise 62% in 2013 to $25 billion. People now spend more time with apps than they do “browsing the Web” in the traditional sense. Gartner predicts that by 2016, more than 50% of mobile apps deployed will be hybrid (combining strengths of native and Web). To create apps that run on multiple devices, developers resoundingly prefer the Open Web Platform. But what is the Web stack missing that would make it rival native and drive greater adoption of open standards? How do we close the gap? Each quarter, Dominique Hazael-Massieux publishes Standards for Web Applications on Mobile: current state and roadmap , a summary of W3C work related to Web applications on mobile, including Rec track updates. We highlight a few topics in this section. The Core Mobile Web Platform ("Coremob") Community Group was launched in 2012 to accelerate the adoption of the Mobile Web as a compelling platform for the development of modern mobile web applications. In late January 2013 the group published Core Mobile Web Platform — 2012, which presents a small number of simple mobile Web application use cases and lists features that the underlying mobile Web platform needs to offer to support those use cases. In May the Membership reviewed new Web and Mobile Interest Group to follow up on the work of the Community Group. Closing the Gap with Native was the subject of one of the 2013 Headlights projects. (W3C Headlights Projects explore potential directions for W3C.) This task force analyzed strengths and weaknesses of the Web and expects to publish later this year a detailed gap analysis and set of recommendations for W3C's agenda. Web-based operating systems. W3C launched the System Applications Working Group in October 2012 to define a runtime environment, security model, and associated APIs for building Web applications with comparable capabilities to native applications. Since launch, the group has published seven specifications, touching on topics such as the security model “outside the browser” and raw sockets. The Web Applications Working Group plans to take up work on a JSON-based manifest format. Packaging and Offline Use. “App cache” is widely deployed. However, the community has concluded it does not address enough use cases. Discussions started in the Fixing Application Cache Community Group later moved to the Web Applications Working Group. That group has recently begun work on use cases for the next generation of App Cache and a JSON-based packaging format. Technological competition will, over time, result in a diminished market share for the “closed” technology products that dominate the landscape today. A clear side-effect of this will be a move from device-based apps to web-based apps that buffer content and tools, but at the same time function cross-platform. This transition offers publishers a much stronger opportunity to invest in end-user satisfaction and successfully invest once to monetize content for numerous platforms. Security. A number of W3C groups are addressing different aspects of Web security. The Web Application Security Working Group published Candidate Recommendations of Cross-Origin Resource Sharing and Content Security Policy 1.0 since TPAC 2012. The XML Security Working Group published 4 Recommendations for XML Encryption and XML Signature in April, including XML Digital Signatures for Widgets. Payments. Web application developers want to monetize their work, particularly on mobile where ads are not as effective as on desktop. The Open Web Platform does not yet offer standard ways to transfer money, demonstrate proof-of-purchase, and meet other payment needs. Without a standard, developers are forced to turn to native platforms, or use solutions that work for one service provider but not another. In addition to the work of the Web Payments Community Group, the Payments Task Force for Headlights 2013 is looking at opportunities and challenges for Web-based payments. We have begun to look into organizing a W3C Workshop on payments in 2014. There is no drawback to working in HTML5. In December W3C announced the complete definitions of the HTML5 and Canvas 2D specifications. Though not yet W3C standards, these specifications are now feature complete, meaning businesses and developers have a stable target for implementation and planning. According to the HTML Working Group’s plan, HTML5 will become a W3C Recommendation at the end of 2014. The HTML Working Group has published a number of new specifications since then, including HTML 5.1, media enhancements (see below for more on content protection), responsive design, and accessibility features. Most of these have been published as “extension specifications” under the group’s plan to use modularity to manage specification size, complexity, and schedules. The extension specification mechanism is also the vehicle for a proposed experiment with document licenses. As a result of a Formal Objection to a proposed charter in February, the Director proposed a draft charter with a provision that gives HTML Working Group participants the means to choose whether to publish extension specifications under CC-BY copyright. As of August 2013, that discussion is ongoing. When you take a look at the future of mobile, HTML5 and Digital Rights Management (DRM) are an unstoppable team, but they need each other in order to win the code wars. The HTML Working Group published the First Public Working Draft of the Encrypted Media Extensions (EME) Specification in May. The topic is known to be contentious; W3C received a petition with more than 20,000 signatures requesting the work be dropped. CEO Jeff Jaffe blogged his Perspectives on Encrypted Media Extension Reaching First Public Working Draft in which he acknowledged the strongly held principles of all parties: “W3C as an organization will weigh a variety of complex considerations to determine the right balance for the Open Web Platform. There are principles and practical arguments on both sides of the debate...We invite the community to review the First Public Working Draft of the EME specification.” Jaffe and others continue to engage in dialog in the Restricted Media Community Group. As the Web has expanded from a document-sharing platform primarily for desktop to a full-fledged platform available on all kinds of devices, so have its testing requirements. Many W3C Working Groups create test suites (for instance, as part of Candidate Recommendation), but more is needed. For the sorts of applications developers want to create, we need levels of conformance, quality of implementation, performance, and interoperability that can only be guaranteed by much more thorough testing. To make the Web Platform a success, we need broad interoperability, and for that we need better testing. For this reason, W3C has launched a comprehensive test program for the Open Web Platform. The program will leverage the momentum of Adobe's series of developer events called Test the Web Forward and adopt the same name for consistency. The project will create a common infrastructure for W3C groups and foster community so that it is easier to write and submit tests, run tests, display results, understand where tests are needed, and prioritize test development. We also expect to allocate resources for test development to catch up on the backlog of tests that need to be written, especially for high priority specifications such as HTML5. Tests will also come from implementers and the developer community. The Tracking Protection Working Group is developing global Web technology that will allow users to express a preference regarding being tracked online, and what is necessary to comply with the user’s preference. The group has made some progress on the more controversial compliance specification, but has not yet reached consensus. In July the Chairs announced a group decision about the base text for continued work. The decision re-affirmed the Working Group's mission to "improve user privacy and user control by defining mechanisms for expressing user preferences around Web tracking" in a consensus-based multi-stakeholder process. Less than 20% of current Web users speak English as their native language and that proportion will continue to decrease as the Web reaches more and more communities of limited English proficiency. If the Web is to live up to the “World Wide” portion of its name, it must support the needs of world-wide users at a basic level as they engage with content in the various languages. W3C pursues this goal in various ways, including coordination with other organizations, creation of educational materials, coordination on the work of other W3C groups, and technical work itself on various topics. Coordination with other W3C Groups & other Organizations. The Internationalization Activity worked with both the CSS and HTML Working Groups to manage the addition of new control characters to the Unicode repertoire related to bidirectional text. In addition, W3C and the Unicode Consortium updated “Unicode in XML and other Markup Languages” and there are plans to substantively update it further once the next version of The Unicode Standard has been released. Technical Work. The MultilingualWeb-LT Working Group announced a last call of Internationalization Tag Set (ITS) Version 2.0 at the end of May. ITS makes it easier to integrate automated processing of human language into core Web technologies. Outreach and Education. An Indic Layout Task Force was created to work on issues that need to be addressed by the Open Web Platform to support South Asian and related languages and scripts. Work is also under way on “Requirements for Hangul Text Layout and Typography”, which, like its highly successful predecessor Requirements for Japanese Layout, will establish requirements for Korean support in the Open Web Platform. The Internationalization Activity continues to organize Multilingual Web Workshops; the sixth was held in Rome in March. This workshop was so far the most successful event in the MultilingualWeb workshop series. Reaching new markets - digital publishing. In June Keio University hosted the Workshop on Richer Internationalization for eBooks. Today’s eBook market is dynamic, fast-changing and strong. eBooks compete with printed versions, and there is a wide choice of hardware and software available for eBook readers. Nevertheless, there is still work to do in order to reach users in their local language and script. See below for more on W3C’s digital publishing activities. HTML Accessibility. The HTML Accessibility Task Force has a new mandate to develop accessibility extensions for HTML5. It has already published drafts of HTML Image Description Extension ("longdesc") and Using WAI ARIA in HTML. Mobile Accessibility. W3C has heard a growing demand for guidance about mobile accessibility in the past year. Accessibility of mobile content and the mobile user interface are addressed by WCAG 2.0 and UAAG 2.0 respectively; however, we are looking at the opportunity to repackage the information to more clearly indicate its relevance to mobile. User interfaces. W3C first published Independent User Interfaces in January and updated it in July. That specification makes it easier for web developers to author consistently usable interfaces that are input-agnostic and independent of a user’s particular platform, hardware, locale, and preferences. It also provides a clear path for web developers to smoothly transition from currently existing physical events to IndieUI events. User Agent and Authoring Tool Accessibility. Both the Authoring Tool Accessibility Guidelines (ATAG) 2.0 and User Agent Accessibility Guidelines (UAAG 2.0) are reaching stages where additional member involvement will be helpful for gaining implementation experience. The digital revolution has led to major changes within the publishing industry. EBooks accounted for nearly $1 billion growth in trade in 2012. Researchers around the world are finding new possibilities to publish their scientific results. Web based archival and search services are challenging the role played by traditional libraries and archives. Self-publishing has gone mainstream, witnessing 287% growth between 2007 and 2012. The Open Web Platform plays an important role in these transformations. For example, many eBooks are published using ePUB3 to package HTML, CSS, SVG, and other Web content. For these reasons, in 2012, through Headlights 2012 and other conversations, W3C began to seek collaboration opportunities with various digital publishing communities such as IPTC, IDEAlliance, and IDPF. 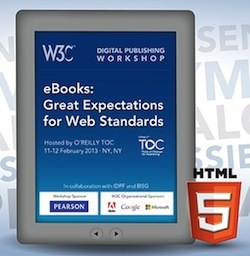 In February this year, W3C held a Workshop on eBooks and the Open Web Platform: eBooks: Great Expectations for Web Standards, in partnership with the IDPF and BISG. O’Reilly hosted the meeting, sponsored by Pearson Publishing. Participants identified a number of technical issues appropriate for collaboration and began to prioritize lists of topics for discussion such as presentation, layout, fonts, or accessibility. With the momentum of this Workshop —and the addition of new Members Pearson and Bloomberg as a result— W3C launched a Digital Publishing Activity to build the necessary bridges between the developers of the Open Web Platform and the publishing industry. For the moment, most of the work takes place in the Digital Publishing Interest Group, a forum for experts in the digital publishing ecosystem of electronic journals, magazines, news, or book publishing (authors, creators, publishers, news organizations, booksellers, accessibility and internationalization specialists, etc.) for technical discussions, gathering use cases and requirements to align the existing formats and technologies (e.g., for electronic books) with those used by the Open Web Platform. In June, W3C held the second Workshop in the digital publishing series on Internationalization for eBooks. Participants gathered requirements for eBooks in global markets and investigated international functionality that needs to be added to the Open Web Platform. In September, W3C holds the third Workshop to bring together publishers, standardization organizations, technology developers, booksellers, accessibility organizations and others to look at what is needed to make the Open Web Platform suitable for commercial publishing, especially in print, all the way from authoring through to delivering the printed product and beyond. W3C has also become more active in publishing industry conferences, including keynote addresses at both O’Reilly Tools of Change for Publishing and IDPF Digital Book 2013. Thanks to mobile Internet, the automobile industry sees many new opportunities to provide drivers and passengers value through connected services. Though mobility is driving the transformation, typical mobile interfaces are not well-suited to driving. Consumers seek integrated digital experiences and increased safety. The car industry also wants to increase safety, and also to offer innovative services at lower cost while maintaining direct relationships with customers. Following a November 2012 Workshop, the auto industry launched the Automotive and Web Platform Business Group in February. The group seeks to accelerate the adoption of Web technologies in the automotive industry. 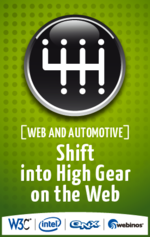 This is the first time that the automotive industry and the Web community have convened to document how the Web can meet automotive needs, and what must be done to get there. The group has grown in five months to more than 85 participants, including people from Intel, QNX, Blackberry, Ford, Porsche, Volkswagen, Fiat, Vodafone, Nokia, GENIVI Alliance, Wipro, Tomo-Digi, Japan Electronics and InformationTechnology Industries Association, Japan Automobile Research Institute, LGE, KDDI, Pandora, Openstream, Sharp, and Opera. The group has held two face-to-face meetings, in Barcelona (April) and Tokyo (May). The group is now reviewing a number of proposals for HTML5-based vehicle APIs. Television, entertainment, and the Internet continue their convergence. People view video content on many types of devices, though tablets are now preferred for viewing over-the-top (OTT) television content. Digital TV Research predicts the Chinese online video market to grow from $50 million in 2010 to $1.38 billion in 2016. A Google study reports that in the US, 77% of the time people are using a television, they are using a second screen simultaneously. People —and young people in particular— are consuming news and other information through channels beyond traditional television. The multiplatform media environment is changing how people seek information such as news, becoming more "portable, personalized, and participatory." What are the opportunities for W3C? An IHS white paper gives on succinct perspective: "While bringing IP-video to the large TV screen represents a clear monetization opportunity, operators have struggled to justify writing native code, optimizing user interfaces, testing, and debugging applications in this complex area of the CE space. The HTML5 specification represents operators’ best hope for mitigating these externalities." The Web and TV Interest Group has been the primary driver for the inclusion of television industry features in core standards, including Encrypted Media Extensions, Media Source Extensions, and multi-track HTML video and audio. After an initial wave of specifications, the Interest Group has created new task forces on Testing, Recording and downloading, Terminal capabilities, Metadata, Stereoscopic 3D, and Timed text/captions. The Interest Group also liaises with several organizations developing TV standards, software and tests for the next generation of network-enabled TV sets, including OIPF, MMI, and HbbTV. In this way, the Interest Group raises awareness of W3C work in this converging market. The Web and Broadcasting Business Group provides another venue where people in the Web and broadcasting industries can study industry convergence. The Business Group is working on a number of Business Group Reports including Towards a Smarter Combination of Broadcasting and the Web . To ensure that video on the Web meets the requirements of the content industry, regulatory bodies, and accessibility community, W3C is working on two formats for Web captions: TTML and WebVTT. TTML 1.0 is widely adopted in the television industry. In February 2012 the US FCC declared the SMPTE Closed-Captioning Standard (an extension of TTML 1.0) as a safe harbor interchange delivery format. In February of this year W3C published TTML Simple Delivery Profile for Closed Captions (US), intended to establish a minimum level of interoperability between TTML 1.0 and legacy caption formats employed in US markets, such as CEA608 and CEA708. The second format, WebVTT, has been in development within the Web Media Text Tracks Community Group. W3C anticipates rechartering the Timed Text Working Group in 2013 to include work on both TTML and WebVTT. W3C launched Community Groups in 2011 to meet the needs of a growing community of Web stakeholders. Community Groups enable anyone to build a supportive community around their ideas for the Web. Community groups are open to all, without fee, and quick to start. In two years the program has grown to more than 3000 participants in more than 130 groups, including Core Mobile Web Platform, Responsive Images, and Extensible Web. A number have published reports, and in some cases (e.g., "The picture element" and "JSON-LD"), Working Groups have taken up the work for standardization. Community Groups have given more people a way to share their ideas within W3C. W3C will continue to tune and improve the system and supporting infrastructure based on our experience so far. China is the world’s second largest economy, with a growing share of online activities. Nearly half of the population in China has an Internet connection, of which a majority is broadband. And 66% of connected users access the Internet through mobile phones. Alibaba’s sales exceeded that of eBay and Amazon combined in 2012. Chinese participation within W3C has grown as well, especially in the past 2 years. Against this backdrop, and after six years of experience with an Office in China, W3C announced the new Beihang Host in January. Two new Members from China have joined W3C since then, and we are adding staff to support additional business development and technical work. In June W3C participated in the Mobile Asia Expo in Shanghai. Later this year, W3C holds TPAC 2013 in Shenzhen, our first TPAC in Asia. We would like to thank Tencent, exclusive Host for the event. The Test the Web Forward event series organized by Adobe brings local developers together to learn to develop tests and improve the Open Web Platform. The series includes two events in China this year: August in Shanghai and November in Shenzhen, alongside TPAC 2013. The February 2013 Kendo UI survey of 5000 developers provided strong evidence of HTML5 adoption. For example, when asked “How will you tackle the challenge of building apps for multiple mobile platforms?” 70% of the developers surveyed answered “adopt HTML5,” and 14% planned one native implementation per target platform plus one “catch-all” HTML app for all other platforms. W3C is addressing growing developer demand for Web technology via a strategic developer relations program. This program includes services to help developers learn how to use the latest Web technology, and new ways for developers to increase their involvement in W3C. Web Platform Docs. Last year we launched Web Platform Docs, a new community-driven site that aims to become a comprehensive and authoritative source for web developer documentation. Adobe, Apple, Facebook, Google, HP, Intel, Microsoft, Mozilla, Nokia, Opera continue to provide support as Web Platform Stewards. Since TPAC 2012 hundreds of people have contributed content in a half dozen “live Doc Sprints.” The site itself has grown substantially in the number, quality, and completeness of articles, with a focus on fast-changing and high-value topics like CSS and APIs. Meetups. W3C organizes Membership meetings twice annually in various locations around the world. We regularly create opportunities for local developers and W3C participants opportunities to mingle at these events, such as the Lyon meetup in October 2012 and the Tokyo meetup in June 2013. Speaking at Dev Conferences. W3C staff speak at numerous developer conferences around the globe. Highlights from the past six months include the Future of Web Design, Kings of Code, AngleBrackets, IT Academic festival, Codemotion, and the Tizen Developer Conference. If you are interested a W3C speaker for your event, please write to w3t-pr@w3.org. Articles. W3C also increased its online engagement with developers and designers in the past six months, including the Hot in Web Standards series in .net magazine, and W3C’s new monthly column in A List Apart. Google Summer of Code. Google Summer of Code is a global program that offers student developers stipends to write code for various open source software projects. W3C earned four slots this year. We worked with students on projects related to the validator, internationalization, and linked data. 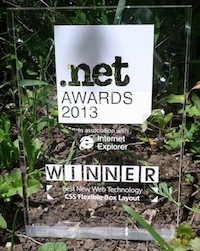 .net awards 2013: Best New Web Technology - CSS Flexible Box Layout. It is interesting to note that W3C received six nominations in all, in two categories of award. OpenStand at South-by-Southwest (SxSW). IEEE, IAB, IETF, Internet Society and W3C announced OpenStand in August 2012 to promote the "Modern Paradigm for Standards" – an open, collective movement to radically improve the way people around the globe develop, deploy and embrace technologies for the benefit of humanity. 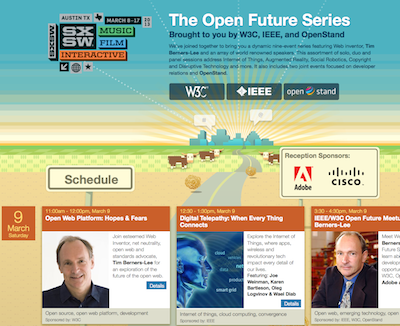 This year, for the first time, IEEE and W3C collaborated on an OpenStand event: the Open Future Series at South by Southwest. The series featured talks by Tim Berners-Lee, Wendy Seltzer, and a number of IEEE colleagues; a public meetup sponsored by Adobe; and an invitation-only reception, sponsored by Adobe and Cisco. In May, W3C signed a joint OpenStand letter, bringing the modern paradigm into a revived US/EU standardization dialog. ISO/IEC JTC 1 PAS renewal and focus on translations. After the initial two years of ISO/IEC PAS status granted to W3C in November 2010, W3C renewed for five years our commitment to transpose some of our most important Recommendations into International Standards. In our renewal documentation, we put a specific focus on the management of translations for our PAS, with better coordination with ISO members interested in reusing our volunteer translation system. EC MSP activity, submitted XML stack and hosting discussion list. In the past six months, W3C has been very active in the Advisory Expert Group related to European ICT Standardization, the so-called Multistakeholder Platform (MSP), set up in 2012 to advise the Commission on its ICT Standardization work program. One the main goals of the MSP is to identify which Fora/Consortia technical specifications in the field of ICT should be referencable in public procurement and policies W3C is now hosting one of the platform mailing lists. Furthermore, we have submitted a package of XML Recommendations through this new system (XML 1.0, Namespace, Infoset, base, etc.). Internet Governance Forum. At the beginning of the year, Wendy Seltzer's status as member of the United Nations Internet Governance Forum Advisory Group ("IGF MAG") was renewed. The group is actively preparing for the October 2013 IGF plenary in Indonesia/Bali. Daniel Dardailler participated in February in a regional IGF gathering in Dubai, in close partnership with ICANN/ISOC, to present to the Arab ICT community (both technical and regulatory audience) how Open Standards and the Open Internet are currently handled by our organizations. ECMAscript testing coordination. As part of our ongoing effort to provide a better test framework for W3C technologies, W3C has taken recent steps to coordinate more closely with ECMA TC 39, the organization in charge of the scripting language of choice for the Open Web Platform. It is important that the ECMAscript test suite be in sync with HTML5 and other W3C specifications that can include scripts. New liaisons. In the past few months, we’ve received several requests for new liaisons including GS1 (supply chain standards, most well-known for the barcode) and The OpenSocial Foundation. There were a number of new liaisons related to the television and broadcasting industry, notably IPTVF, HbbTV, ATSC, DTG, and CEA. Health care/life sciences. W3C promotes the use of Semantic Web technologies by the Health Care/Life Sciences community. HL7 is a member of W3C and already uses our standards (such as XML Schema) in their health informatics standards. They now want their work on FHIR (a novel, REST-oriented standard for clinical data) to be SemWeb-friendly and have RDF representations. The Open Web Platform is now widely recognized as the premiere solution for cross-device and cross-platform development. To fulfill this promise, however, W3C must promote strong interoperability (through testing), high performance, stability (especially for consumer electronics), and a comparable or superior experience to native apps. Through our outreach to the digital publishing, automotive, and entertainment industries, W3C is learning how these communities are using the technology and what they need. Through liaisons, developer relations, and growing W3C Membership, we will continue to strengthen our bonds with these industries and, in doing so, foster greater interoperability. The growing W3C community is well-positioned to guide the next wave of technology development and to take a leadership role in extending the Open Web Platform to new industries.